Since we set up five years ago, Sustainability Consult has handled clients’ participation in events and exhibitions, even representing them on their stands at international trade events. So it was high time we had our own stand and represented ourselves. So, we did. We decided to have a stand at the biggest conference on the bioeconomy in North America. 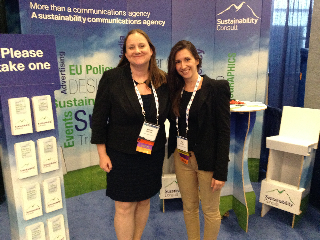 Sustainability Consult exhibited at the 10th BIO World Congress on Industrial Biotechnology in Montreal, 16-19 June. Inspired by our 2013 advertising, we created a cardboard stand featuring our wordcloud and new tagline ‘More than a communications agency. A sustainability communications agency’. We had a blast and the show was a great success in all respects. Here’s an overview of what we got up to in Montreal. Day One – 16 June. Kathryn and I set up our beautiful, renewable, reusable and funky cardboard stand. Everything was made from cardboard, even the chairs and table. Then we put on our nice and freshly ironed clothes, went to the Welcoming Reception and began meeting people. Days Two, Three and Four – 17-19 June. We were both on our feet early on and took our exhibition kit, camera and great mood along with three kilos of Belgian chocolates from Neuhaus (brought all the way from Brussels to treat our visitors at the booth). Both the chocolates and the cardboard stand were a massive hit which was no surprise. The conference proved to be very interesting from a networking perspective. We shared our experience in sustainability communications with different stakeholders within the bioeconomy field and learnt a lot from our interactions. We also ran a competition to win a free Communications Audit. The importance of credibility communications in the biobased sector was the main topic of conversation on our stand and this subject generated a lot of interest in our work. We had prepared a brochure with Five Commandments for Responsible Bio-based Communications. We were also fortunate to be invited to some receptions after the conference. At both the Biotec Canada event sponsored by our client BioAmber and the Alberta reception, we met more interesting people. The BIO World Congress was enjoyable for us on many levels. 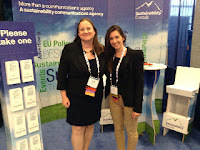 We profiled Sustainability Consult’s expertise in the bio sector, we met new people and we shared our passion for sustainability communications. So our first exhibition was deemed a success. The next stop for us will be the European Forum on Industrial Biotechnology (EFIB) in Brussels on 30 September-2 October 2013. We may see you there.